It’s a wonderful day today, for no particular reason other than the sun is out. That makes it a perfect time to list some of the fabulousness in my life today. My daughters. These girls have grown up to be fabulous women and my best friends. My mom. I’m so pleased we have finally developed a loving, warm relationship, and I frequently hear her tell me “I love you very much.” There was a day I doubt she felt that way. My grandkids. They are the light in my life and they keep me young and entertain me with their silliness. I am lucky they live nearby. Springtime. I love the flowers that are blooming, and the promise of warm Summer days that they bring. I’m employed. A string on my work email today tells of all the people who are “WAH” today. I’m always “WAH” (work at home). Thank you very much. I’m healthy. Significantly more so than I was last year. I don’t care if I’m single or not. I’m living life, loving it, and having fun. I seem to have an incurably optimistic attitude about life. Where did that come from? I have more friends than I ever knew I had. In the depths of depression (years ago) I thought I had none. I realize now, it was I who stepped away. What is fabulous in your life this Friday? ← Who’s the Cat and Who’s the Dog? I suspect, Birdpress, that many of the people in my neck of the woods were too busy out enjoying the beautiful warm sunshine to be bothered reading my gratitude list. However, Mermaids and you did (and Mermaids did her own Fabulous Friday post) so I’m happy with that. I love your list and find it very inspiring. I’ve been trying to make mental lists like this every morning, it really does help to start the day off a positive note. 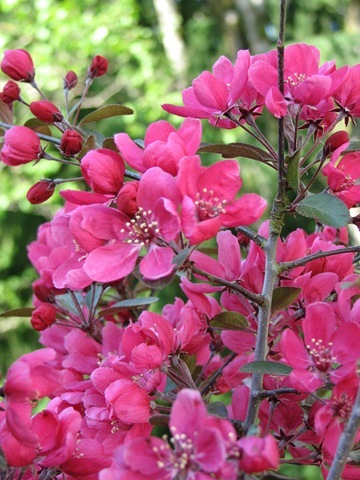 And your crabapple blossoms are MAGNIFICENT. So wicked beautiful! Wendy, I do a mini list – probaby a couple things, even just one – in my head every day at a random time. You are right – I find it really helps with my attitude. I saw a couple full grown, mature crabapple trees yesterday in my walk and they are truly magnificent. I’m so glad I picked that one out. I wonder why more people don’t grow them. The blossoms are so fragrant – at least mine is.